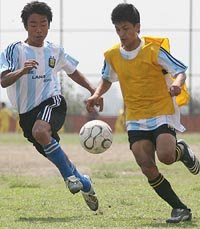 wearing different countries jerseys in Nepal is like old disease and very few of the schools they put crest on the jerseys. I can see almost all the schools they have their own crests. Its big question that why organizer never make any kind of rules about the kits , logos etc. But why many of the school they use Argentina National jerseys. May be its easy to buy ready made jerseys from different countries National teams than giving new order to the tailors. It's easier to not do homework than to do homework. So is that what schools will teach their students?